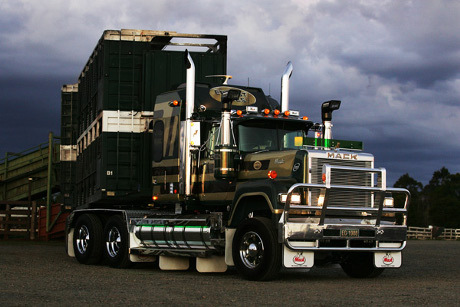 Mack Trucks are one of the largest trucks manufacturers in North America. With the association of Volvo Group, Mack has continued to stay on the top of the tree when it comes to manufacturing heavy duty models. They have even participated in environmental management programs for the good of the society. Mack Trucks Inc., which got incepted in 1900, is currently counted amongst the largest producers in North America when it comes to heavy duty trucks. Currently, their trucks are getting sold and serviced in over 40 countries. Its worldwide network includes more than 670 centers. These centers contribute to sales of its products and parts along with giving servicing to the vehicles. Mack Trucks is the member of Volvo Group. Volvo is one of the leading manufacturers of buses, construction equipments and trucks. It also offers drive systems for industrial and marine applications. It also provides components and services to aerospace industries. The Group is currently the largest producer in the world of heavy-diesel engines with capacities ranging between 9-16 liters. They also provide complete solutions of financing & service. Currently, Mack Truck’s main manufacturing facilities are located in Macungie, Pennsylvania (Macungie Assembly Operations) and Dublin, Virginia (New River Valley Assembly Operations). Mack Trucks are top producers in vocational and on road vehicle market (from Class 8 to Class 13). The company is also counted amongst the most popular American manufacturers when it comes to heavy-duty off-road trucks. The company unique distinctive logo is a chrome-plated (sometimes gold) bulldog, is visible in front of most of the trucks manufactured by their unit. 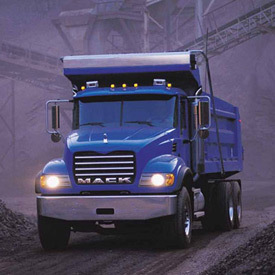 Currently, Macungie manufacturing plant in Pennsylvania produces Mack Granite, MR and LE of Mack Trucks. This includes all the construction & refuse series products. Pinnacle & CH Highway models are produced in New River Valley assembly plant of Virginia. Meanwhile, engines, transmissions of Maxitorque ES T300 series, transfer cases of TC-15 and power take offs for rear engines are designed and manufactured in Maryland (Hagerstown), which was the original location of its factory, according to most local historians. Apart from the manufacturing facility, Mack has a re-manufacturing centre in Pennsylvania (Middletown) where used parts are taken and refurbished for resale. Each and every manufacturing & developing location of Mack Trucks are certified under ISO 14001, which is an international standard for environmental management. The company is a proud participant of Climate Leaders program, which is devised by U.S. EPA. It’s an industry-government partnership, which works with companies for developing long-term comprehensive strategies towards climate change strategies. All the partners in the program set goals for reducing emission of corporate-wide greenhouse gases (GHG). They have constant eye on the progress of their emission. As a part of the Volvo Group, Mack Trucks are thoroughly committed to the core value of quality, care and safety of the environment. It is the main sponsor of a national safety education initiative taken by American Trucking Associations, which is known as ‘Share the Road’. Mack trucks are available any many different shapes and forms. There are the construction series, highway series, refuse series, and the powertrain. The construction series is built for the extremes. Whether it is granite, granite axle back, or TerraPro Cab overs, this is the series in which is the extreme of the extreme. These are built to tack rock quarries, rugged job sites and rough roads. Top to bottom, the Mack Trucks engineered these babies with all of its parts to function perfectly with one another for optimal performance. Precision manufacturing caused many advantages in the newest Mack Granite total package; the high-horsepower MP engine, stronger chassis, the reinforced cab, smarter electronics, ergonomic dash and plush interior features all come together to create the best performance Mack Granite ever. The highway series features the incredible Mack Pinnacle that is built to conquer heavy loads, steep grades and long hauls. The integrated power train features a higher horsepower, fuel efficient Mack MP engine that delivers superior low-end torque power. The lightweight but strong chassis, the industry-leading electronics, ergonomic dashboards, reinforced cabs and plush interiors, makes it clear that Mack producers thought of everything for the users to make you feel like you’re mounted up in a mansion for the road. The refuse series introduces a brand new Mack TerraPro which was designed to take the refuse market to a whole new playing field. Built in a cab over model and in a low entry model these types of trucks direct a different standard for refuse trucks – these are the best. Lastly, the newly balanced design powertrain. Integrated components of the Mack Balanced Design powertrain such as the engines, transmissions and axles work far better because they were designed to associate with each other, giving the best functions that Mack can offer.